Kyle Knits - a boy, his cats and way too much yarn: Thankful. My family - all of them - even the ones who make me crazy or upset me from time to time - all the way to the ones who have broken my heart. Each and every one of them has helped me grow to be the person I am today. My partner - he's my life. Sharing everything is so much more fun with him! my pets - the kitties and doggies - they're my heart. I am thankful for living in all the different places I have during my life - across the U.S. - having the chance to meet different people and learn from all of them. My Grandma's chicken and dumplings - so good even the memory makes my mouth water - also banana salad which lots of people think is wierd, but for me is part of tradition. Clearance Sales - buying things that are priced 80% off makes me happy. Martha Stewart - she's a good thing, too! goodies in the mail - receiving cards or notes or packages always gives me a lift - so does a day without any bills in the mail! having bills - even though they're a pain, responsibility (and the ability to be responsible) is worth being thankful for. YOU - the "invisible" folks who visit my blog and read the things I write - and the "not so invisible" folks who comment - and those of you who have become friends - you're all important to me - and I'm thankful that you come back from time to time to check in with me. Peanut Butter. Let's face it; I love the stuff! my computer - it was a gift from a close friend - AND it's a MAC! - and while it's a few years old, it's an amazing piece of equipment and I can't say how thankful I am for it - it's reliable and perfect! My history - everything I have gone through to get me here - the bad times and the good - all the steps I have made to get me to this day - aside from the temporary hardships that challenges place on us, the lessons we learn stay with us for a lifetime. My future - however long it is, on this planet, with this blog, with my family, at my job, in California or wherever I end up, I am thankful for this moment and every second that leads me forward. It's all a process - and it begins with being grateful. LMFAO!!! Opposable thumbs - truly a gift and I will never take them for granted again or see them without thinking of you! I'm thankful that something as simple as blogging has brought so many diverse people from around this planet closer, one post, one project, one FO at a time. Ah yes Wanda...we know her alter ego. Sweet boy comes to faerie camp. 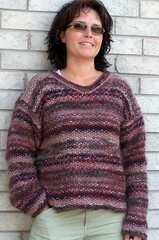 Love that Noro, such an appealing yarn! Have a great holiday. I'm thankful for the internet which is so full of wonderful people just like you! Beautiful scarf. I posted a picture of my "family" which is my boyfriend and my kitty on my blog. Thank you for a wonderful list of reminders, both serious and fun! I'm thankful for my family (furry and otherwise), for health, and for all of the wonderful friends I've met through the knitting community. We are a blessed group to have each other!